Oh, the hilarity. 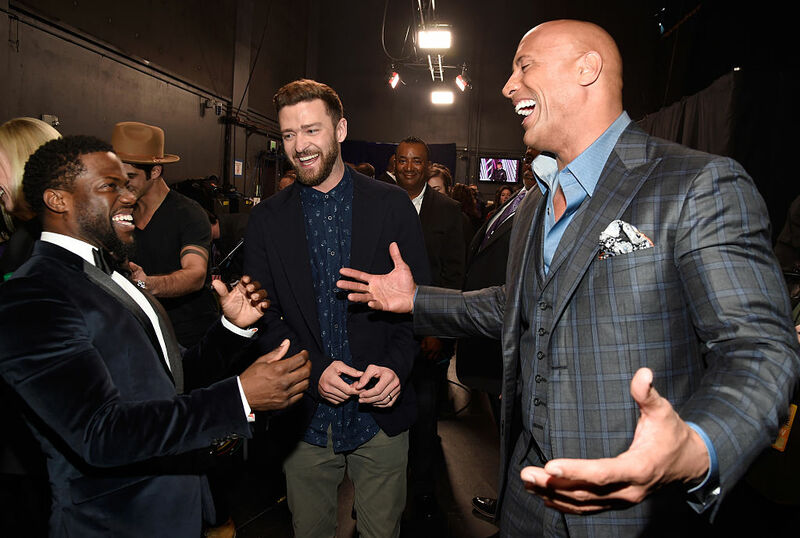 While sitting in the audience during Wednesday night’s People’s Choice Awards, The Rock wasn’t successfully censored when he flipped the bird at Kevin Hart, because he’s The Rock, and The Rock does what The Rock wants. Hart won the People’s Choice Award for Favorite Comedic Movie Actor, which was a surprise to absolutely no one considering how incredibly funny Hart is ALL THE TIME. And as Hart made his way onto the stage to accept his coveted award, the camera showed The Rock beaming with pride. During his acceptance speech, Hart gave his due thanks to all the deserving people and to the higher being in his life. “I thank God, there is no me without God. I gotta thank my beautiful wife and kids. I gotta thank my amazing fans for the support that you guys have given me in this amazing career,” Hart began. But when he mentioned his pal The Rock, well he didn’t so much thanks him as he did…well, insult him. But he insulted him in the most hilarious way, of course. "Last but not least, all of the co-stars that I've had in my life that helped me grow in this business. I appreciate you all, I'm definitely able to do what I do because of the help that I've had on camera. So, this one goes to all the co-stars that I've had except for The Rock, because he hasn't helped me. You've actually lessened my talent, it's gone down since you've been in my life." The Rock’s reaction was perfection. As the camera cut to him, he stuck up his middle finger, because really what else was he supposed to do? The best part is that CBS failed to censor him completely. Whoopsie. The Rock cannot be censored! Which is totally fine — it made for funnier TV anyway.